vii. Polly Anne, b. Sept. 15, 1804; d. June 13, 1890, m. Aaron H. Payne. viii. Auretta, b. Mch. 15, 1809; m. Nov. 8, 1874; m. Samuel Perley. ix. Emeline, b. Aug. 25, 1811; d. Aug. 31, 1896, m. Maro Bradley. 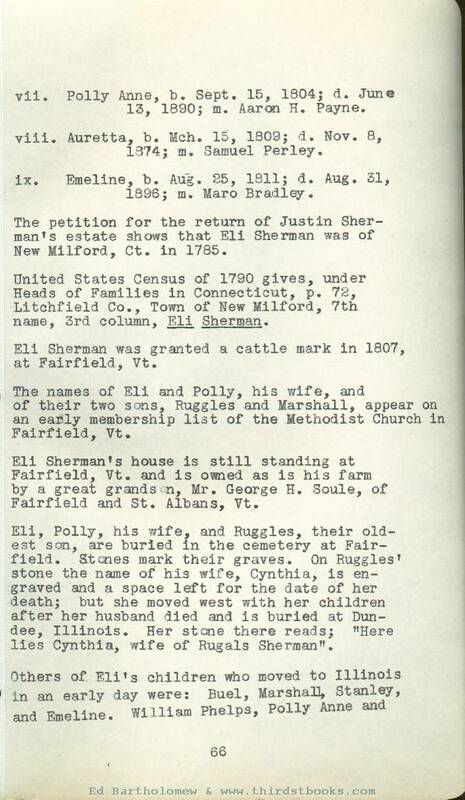 The petition for the return of Justin Sherman's estate shows that Eli Sherman was of New Milford, Ct. in 1785. United States Census of 1790 gives, under Heads of Families in Connecticut, p. 72, Litchfield Co., Town of New Milford, 7th name, 3rd column, Eli Sherman. Eli Sherman was granted a cattle mark in 1807, at Fairfield, Vt. The names of Eli and Polly, his wife, and of their two sons, Ruggles and Marshall, appear on an early membership list of the Methodist Church in Fairfield, Vt.
Eli Sherman's house is still standing at Fairfield, Vt. and is owned as is his farm by a great grandson, Mr. George H. Soule, of Fairfield and St. Albans, Vt.
Auretta spent their lives in Vermont. Justin II did not move to Vermont with his parents and spent his life in New Milford, Ct. The marriage record of Eli Sherman and Polly Phelps is on file in office of the town clerk, at Sherman, Ct. (Formerly North Society of New Fairfield, Ct.
Charles Phelps bought land in Joshuatown, Lyme, Ct., from Nathan Tiffany, May 29, 1788. Lyme Land Records, vol. 4, p. 69. (Joshuatown was named for an Indian who be- came a Christian and changed his name to Joshua.) 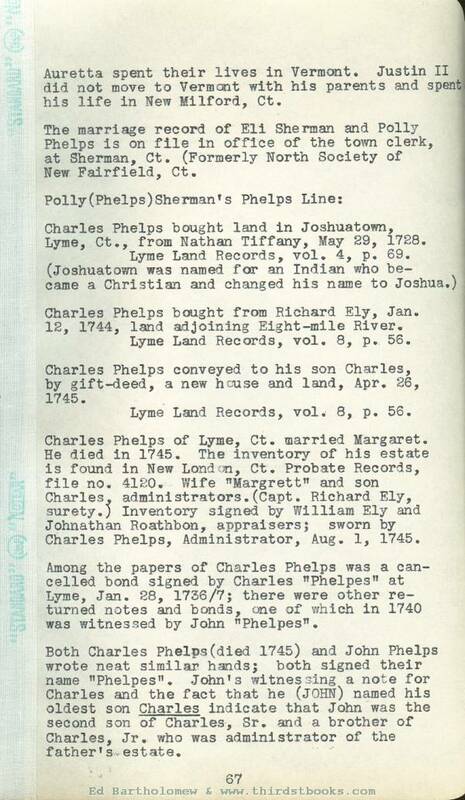 Charles Phelps bought from Richard Ely, Jan. 12, 1744, land adjoining Eight-mile River. .
Lyme Land Records, vol. 8, p. 56. Charles Phelps conveyed to his son Charles, by gift-deed, a new house and land, Apr. 26, 1745. .
Lyme Land Records, vol. 8, p, 56. Charles Phelps of Lyme, Ct. married Margaret. He died in 1745. The inventory of his estate is found in New London, Ct. Probate Records, file no. 4120. Wife "Margrett" and son Charles, administrators. (Capt. Richard Ely, surety.) Inventory signed by William Ely and Johnathan Roathbon, appraisers; sworn by Charles Phelps, Administrator, Aug. 1, 1745. Among the papers of Charles Phelps was a cancelled bond signed by Charles "Phelpes" at Lyme, Jan. 88, 1756/7; there were other returned notes and bonds, one of which in 1740 was witnessed by John "Phelpes". Both Charles Phelps (died 1745) and John Phelps wrote neat similar hands, both signed their name "Phelpes". John's witnessing a note for Charles and the fact that he (JOHN) named his oldest son Charles indicate that John was the second son of Charles, Sr. and a brother of Charles, Jr. who was administrator of the father's estate. 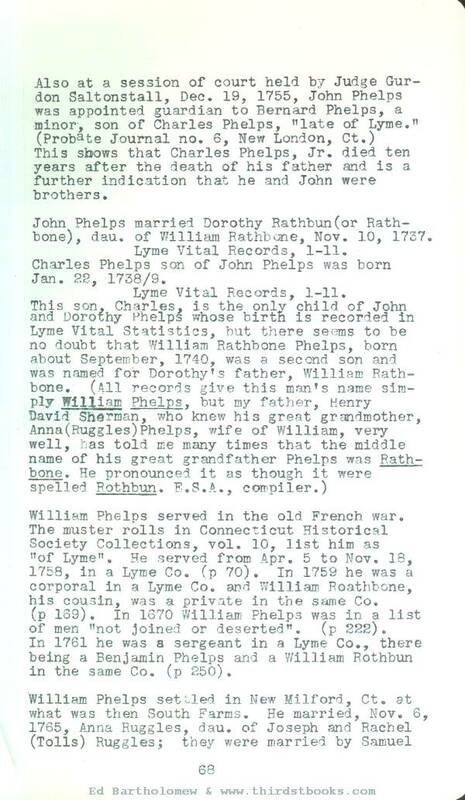 Also at a session of court held by Judge Gurdon Saltonstall, Dec. 19, 1755, John Phelps was appointed guardian to Bernard Phelps, a minor, son of Charles Phelps, "late of Lyme." (Probate Journal no. 6, New London, Ct.) This shows that Charles Phelps, Jr. died ten years after the death of his father and is a further Indication that he and John were brothers. John Phelps married Dorothy Rathbun (or Rathbone), dau. of William Rathbone, Nov. 10, 1737. Charles Phelps son of John Phelps was born Jan. 22, 1738/9. William Phelps served in the old French war, The muster rolls in Connecticut Historical Society Collections, vol. 10, list him as "of Lyme". He served from Apr. 5 to Nov. 18, 1758, in a Lyme Co. (p 70). In 1759 he was a corporal in a Lyme Co. and William Roathbone, his cousin, was a private in the same Co. (p 169). In 1670 (sic) William Phelps was in a list of men "not joined or deserted", (p 222). In 1761 he was a sergeant in a Lyme Co., there being a Benjamin Phelps and a William Rothbun in the same Co. (p 250). i. Ruamah, b. May 31, 1766.
iii. Polly, b. Aug. 25, 1770. 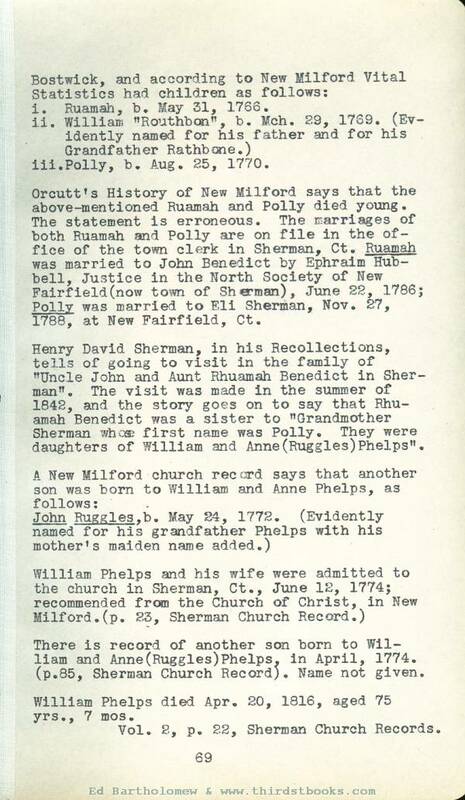 Orcutt’s History of New Milford says that the above-mentioned Ruamah and Polly died young. The statement is erroneous. The marriages of both Ruamah and Polly are on file in the office of the town clerk in Sherman, Ct. Ruamah was married to John Benedict by Ephraim Hubbell, Justice in the North Society of New Fairfield(now town of Sherman), June 22, 1786; Polly was married to Eli Sherman, Nov. 27, 1788, at New Fairfield, Ct.
Henry David Sherman, in his Recollections, tells of going to visit in the family of "Uncle John and Aunt Rhuamah Benedict in Sherman". The visit was made in the summer of 1842, and the story goes on to say that Rhuamah Benedict was a sister to "Grandmother Sherman whose first name was Polly. They were daughters of William and Anne (Ruggles) Phelps“. There is record of another son born to William and Anne (Ruggles) Phelps, in April, 1774. 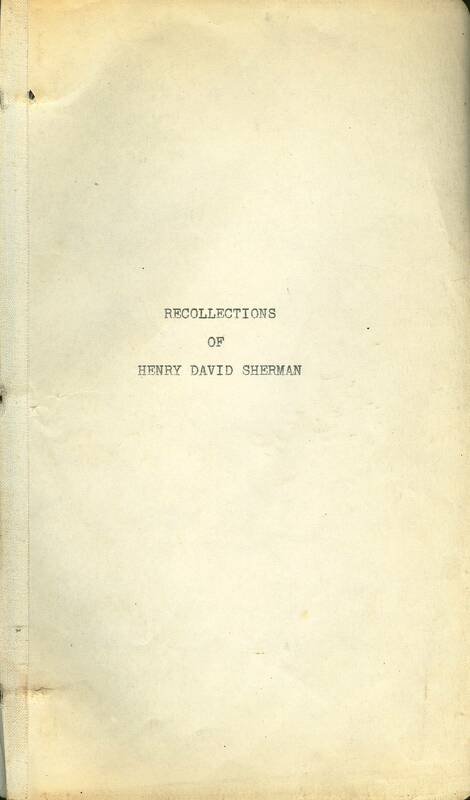 (p.85, Sherman Church Record;. Name not given. William Phelps died Apr. 20, 1816, aged 75 yrs., 7 mos. His widow, Anne (Ruggles) Phelps, died Aug. 15, 1840, at New Milford, Ct.
John Ruggles was a native of Naseing, Co. Essex, Eng. He and his wife, Barbara, came to New England in 1654. They came in the same ship with Eliot, missionary to the Indians, They had one child, a son, John. They settled in Roxbury, Mass. John Jr. moved to Suffield, Ct, He had a son, the Rev. Benjamin Ruggles, who was graduated "honorably" at Harvard in 1695, when only 17 years old. He was ordained at Suffield in 1698, and died there Sept. 5, 1708, aged 34 years. He married Mercy ___• They had a son, Capt. Joseph Ruggles, who went to New Haven and married there, Nov. 15, 1772, Rachel Tolls. They moved, to the extreme south part of New Milford where William Phelps also lived until his removal to Sherman, in 1735, and Joseph became partner in an iron works at Halfway Falls, now in Brookfield, Ct. He bought a large tract of land, and died in Brookfield in 1791, aged 90 years, having been for some years a deacon of the Separate Congregational Church of New Haven, and later deacon of the Congregational Church of Brookfield. He was married three times; his daughter Anna, who married William Phelps and is mentioned in his will as "ann phelps wife to william phelps", was the daughter of his first wife, Rachel (Tolls) Ruggles. 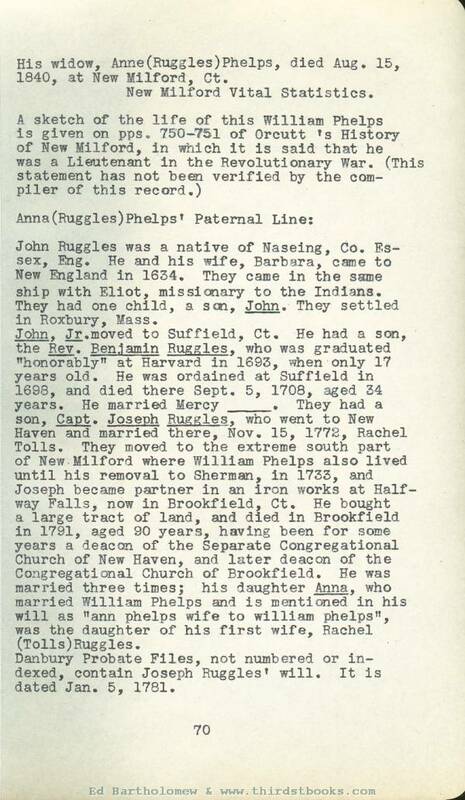 Danbury Probate Files, not numbered or indexed, contain Joseph Ruggles' will. It is dated Jan. 5, 1781.